Signs - Ants all over the place. - there aren't any other signs as they aren't really damaging, see below. Damage - Contrary to popular belief ants do little or no direct damage to your garden plants. They don't eat leaves (apart from leaf cutter ants in tropical climates - and even then they farm the fungi that grow on the leaves - a far more noble endeavour). They don't lay eggs in trees either - they're much better parents than to leave the eggs laying around. Ants are nuisance rather than a serious pest. The worst they actually do to your plants is to farm aphids for the sticky sugary honeydew that the aphids secrete. To this end they protect the aphids on plants from predators that might attack the aphids and pick them up and carry them to new pastures treating them like particularly stupid cows. The discarded honeydew can make your car sticky and also allow fungus to take hold on plants as it gives the leaves a nice sugary coating to get the spores started. Ants build nests which in the lawn can interfere with mowing (but not if you mow as regularly as you should - see the ants as a natural clock reminding you) in containers they can loosen the compost and cause it to fall out of the bottom. Nests can also build up around low growing plants, using the foliage like scaffolding, which can bury small plants and look unsightly. Ants also generate a lot of distaste, particularly as they troop across your kitchen work surfaces looking for the sugar bowl. Ants in the compost heap- a common occurrence, stop being a wuss. Distribute the compost heap in the normal way and the ants will disperse and probably be eaten by the birds - particularly the queens or flying ants which are particularly juicy. Leave the top open if you do this for a few hours while you retreat elsewhere and the neighbourhood birds will come to investigate and leave somewhat plumper. Flying ants- a wonder of nature, I never understand why people get worked up about these. It's the next generation of ants being distributed away from the nest. The idea is that they leave, that's what they want to do. If it really upsets you, go inside and watch a movie instead, and get a take-away. Next time you look it'll be fine. I know many won't like to hear this, but the best and most successful approach is to leave most of the nests in your garden alone, and just to deal with those nests that are problems - like those ants that enter the house on sugar raids, or the ones that wait for you to sit on the grass and then bite your bum. Ants are a natural part of the landscape, and the best way of eliminating new queens flying in from elsewhere are the ants in the nests that are already in your garden - they kill and eat them on landing. Eliminate the ants completely and you'll end up with more than ever in the near future until they settle down to a balanced equilibrium as they probably are at the moment. Ants don't like Eucalyptus oil, so a spray of this may deter them from your favoured areas. Boiling water, my mother's preferred treatment. The trick is to get the queen who is often deep underground or protected, so digging away at the nest a little will allow the water to get down deep and do its work. As much as possible as quickly as possible will be more effective, so have two kettles or a follow-up pan from the cooker. Putting an upside down large terracotta plant pot over the nest and pouring the water through the drainage hole (a large funnel will help here) can keep it in a smaller area. When the ants crawl into the pot, turn it the right way up and let hem have it with more hot water. Preventing access. Sounds obvious, but ants in the house tend not to come in through the door, they gain access through cracks and splits in brick and cement or gaps around woodwork. Trace where they are coming from, get the filler out and you may well solve the problem. Anti-ant dust of various kinds. Reasonably effective, but only gets the troops on the ground, doesn't stop HQ from sending more. Ant traps based on Borax are the most effective. These take the form of small covered plastic boxes around 3-4" in diameter with a tube of poison gel that you put in the middle of the plastic trap and replace the lid. The trap then goes on the route of one of the ant runs. The advantage is that you don't need to hunt out the nest, the ants do the job for you. I've always had mixed feelings about these as it seems too much like dirty tricks. The forager ants find the poison, think it's food and take it back to the nest where they feed it to all the other ants including the queen when it then poisons them. Effective, but not immediate, may take a week or two to work. Eating ant eggs with honey is a traditional cure for the love-lorn, not totally guaranteed to raise the spirits though. It is very lucky to find an ants nest near an entrance to your property as they are a sign that prosperity and financial success are on their way, keep shtum about the sugar bowl though in their ear-shot or they'll be in like Flynn. 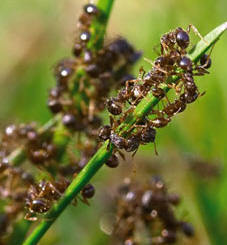 Many countries see ants on the move as an omen of bad weather, stepping on any ants means that heavy rain will follow. Q.I have a cherry tree in the garden, I think the variety is sun burst or sun blush. Anyway, the cherries produced have been tiny, red and shriveled. Also the leaves don't look healthy. In addition, it is crawling with ant which have laid 1000's of black eggs resulting in some of the leaves curling up and underneath they are riddled in black eggs. What do I need to do and how can I get the best out of my tree. I haven't a clue? 1/ spray with a systemic insecticide to kill the aphids. 2/ Kill the ants nest if possible (more difficult) with ant traps. I used to have a similar problem with a "Stella" cherry tree. I sprayed it against aphids every two or three weeks in the spring and early summer for the first year, then the ants and aphids seemed to just give up. The problem about attacking the ants is that another nearby nest takes over. If you deny them the resource of aphids on the tree, they have to make do elsewhere. A. There's not really any quick and easy way to this apart from digging up the nest and removing the queen, this is not usually an option in a lawn. The easiest way is probably to pour boiling water down into the nest, this has the effect of killing lots quickly but rarely gets to the heart of the nest first time, the boiling water will also kill the grass. Likewise ant powders and sprays have an impressive superficial effect rarely sorting the problem first time. Borax ant "traps" are effective but take time, they consist of a covered plastic dish about 10cm in diameter with a central reservoir that you fill with the supplied poison. The idea is that the ants enter and think its food and take it back to the nest to feed to the other ants - seems a bit sneaky to me. Any poisons should be laid when the ants are active so that it affects the maximum number of them. A better way to help reduce the amount of ants in the lawn is to mow at regular intervals, if the hills get regularly flattened than the ants often give up and move somewhere else or are unable to build a large colony. Use a cane to swish away any soil build up too. Although they can give you a very itchy bite, red ant bites in Britain are harmless and the ants themselves don't harm your plants unlike the black variety that frequently run aphid "farms" for the sticky honeydew that aphids produce. Along with bees, wasps, ichnuemen flies, brachionids and other things you've never heard of, ants belong to the order Hymenoptera, characterised with one pair of wings and a very narrow waist between the thorax and abdomen. Most ants you see are female workers and are sterile. The queen lies at the centre of the nest and lays eggs of mainly sterile workers - these are all clones - the insects thought it up long before we ever thought it was a weird and scary subject for movies. Only later in the season does the queen use the sperm she stored during her nuptial flight from her old nest to fertilize some eggs and make new male ants that will fly and fertilize females - virgin queens from other nests. Ecologists regard ant nests as being the ecological equivalent to a single much larger predatory organism rather than as thousands of individual insects. They are only as genetically varied as the genes carried by the queen and the individual workers are more like the body cells of an organism rather than organisms in their own right. Workers never breed or exist autonomously outside of being one of the nest whose ultimate job is to rear as many offspring as possible from eggs laid by the queen. The worst ants in the world? Are generally acknowledged as belonging to the sub-order (sometimes known as the infra-family) Pantonii - the "Pant Ants". In extreme cases, severe infestation of these crazed formica have led to uncontrollable navel gyrations. Many have rued the day they scoffed that "ants in your pants make your belly button dance". Occasionally it is possible to hear a group of ants singing "High Hopes" (you need to get your ear down low and listen really carefully) this is the ant version of a "yo-ho-heave-ho" type chant, don't be surprised if large objects start moving (rubber tree plants are especially vulnerable).